I always love to read the writings of one of my favourite authors, Charles Eisenstein, and his latest blog post “Elephants: Please Don’t Go” is another beautiful, inspiring and thought provoking piece. In this age of planetary destruction, the elephants are losing their habitat at an alarming rate and may become extinct within the next decade. This outcome could only be described as an absolute tragedy, and as Charles explores in his article, may hold greater significance for the world, then we are consciously aware of. I have always held a great affinity and love for animals, understanding that they hold a essential place on this earth and have much to teach us. Having explored the spiritual side of working with horses, and experiencing amazing insights and development through this practice, I have no doubt that there is much knowledge and wisdom in the animal kingdom that is beyond our current level of awareness. 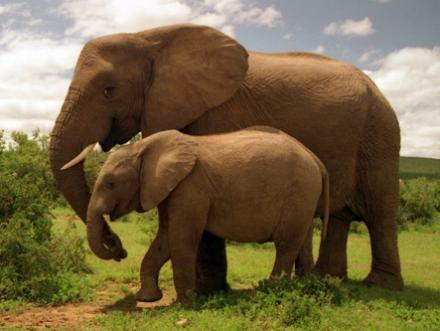 The story about the elephants, and what they bring to the earth, is another example of this layer of knowledge and reminds me of a story in a book called “Animals as Guides for the Soul” by Susan Chernak McElroy. An animal intuitive was called to communicate with an elephant who had been captured and taken from her herd, shipped to America to perform in a circus for many years, and eventually ended up in a breeding farm where she lost an enormous amount of weight and became very ill. Even after a transfer to an animal refuge and being showered with love, affection, nutrition and veterinary support in a more natural habitat, didn’t lead to her recovery, so the animal communicator was called to see if they could get to the bottom of Barbara, the elephant’s, problems. Some of the messages she received from Barbara were just amazing and whether you believe in this type of communication or not, the messages are still profound, no matter which way they were delivered. Barbara the Elephant says: “We care deeply for each other, and we move and breathe as one great gray and luminous heart. What one feels, so do we all feel, and as much as we are attuned to one another, we are attuned to the Great Mother Earth herself: her pain, the scars upon her body, the tears of her great rivers as they attempt to remove impurities from her quivering form, the clouds of brown particles that surround her glittering countenance, impeding the inflowing of the great central sun. It is true that an elephant never forgets, for we are the earth’s historians. We come to you now to raise your awareness of the great suffering of this beautiful earth that we share. Her life hangs in the balance and the outcome is in your hands. She can become again the Eden of long ago – a paradise – or she can go the way of other planets of her kind, becoming dark, cold, and lifeless orbs circling endlessly through the void of space. Life is a symphony, with each living being contributing its own special note, without which the symphony loses its great depth and beauty. We the elephants sound a deep note, a note so low that those of your species cannot hear it. It is the bass note in the symphony of life around which all other beings sing their own unique songs. We sing this deep note continuously to Mother Earth to balance, soothe, and nurture her. The great whales perform the same function for the oceans of the world, sounding a note of very high frequency that balances and tones the oceans of the world. I urge you to read the article “Elephants: Please Don’t Go” and let me know your thoughts in the comments below.